Create visible, accessible storage space instantly with this Finether 4-tier modular cut-out wood plastic composite storage rack shelving unit organizer shelf bookcase. 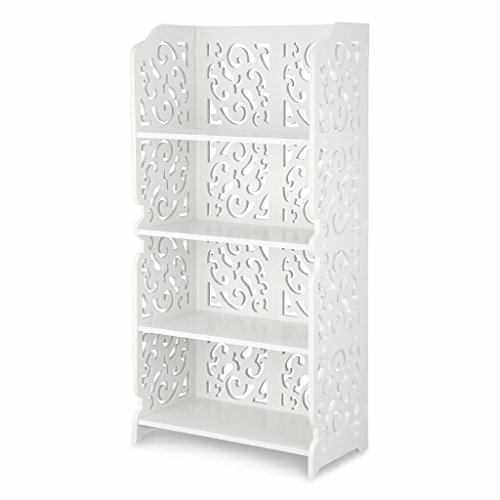 Featuring a modern white color and fabulous cut-out design, this bookcase is a graceful complement to any decor. 4 wide shelves allows for smart storage to keep your things fashionably organized with ease of access. You can assemble the shelving with all 4 shelves, or take out one shelf or more to accommodate items of different heights. Tool free assembly within 5 minutes. Whether you use it in the living room, bedroom, kitchen or office, it is sure to be a blend of function and style.